Hi dear book readers and friends! I didn't want to admit it at first. I didn't want to go on hiatus but I had to. So that's what happened here. I wasn't able to blog for almost a year because time wasn't really my friend. And I was sad because of that. Knowing that I won't be able to post anything on my blog or visit my friends here. I love reading and blogging, and not being able to them is just depressing. 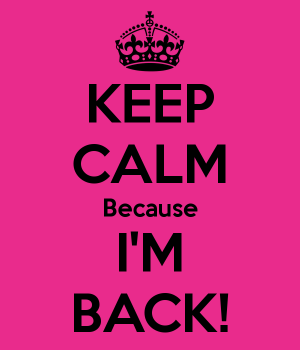 But now, I'm really back! I changed my theme as you can see and I'm not yet done with the edits. Just a few more! I'll start posting my usual stuff and hope to see you guys here! Happy blogging!